It is always challenging getting started whether it be joining a new firm or settling up your own business. It is very hard to convince people because the vision is already farfetched that people really don’t accept something ordinary. Even though your degrees and certifications might have been hanging around your neck, but that don’t give you the license of getting a good job and become an employee of a reputed organization. Therefore a skill at hand is also vital without which is difficult to get through the hurdles that come your way while getting your job done. Every businessman wants a good business card for himself that speaks louder than just words. He wants his card to look magnificent, attractive and vocal enough to be understood by the layman. Therefore he never hesitates in approaching the most expensive method of business card making and designing. There are few tips for the graphic designers while making a business card for a company. A: He must keep a reality check, that what does his client want? B: He must have multiple ideas to support his designing. C: He should provide his clients with choices to choose from so there will be less chances on part of the clients to disapprove. D: It should not be merely a design rather a whole lot story packed on a card. So the very glimpses will give the clues that what does the company stand for, what is their genre of work and what potentials it pursues. 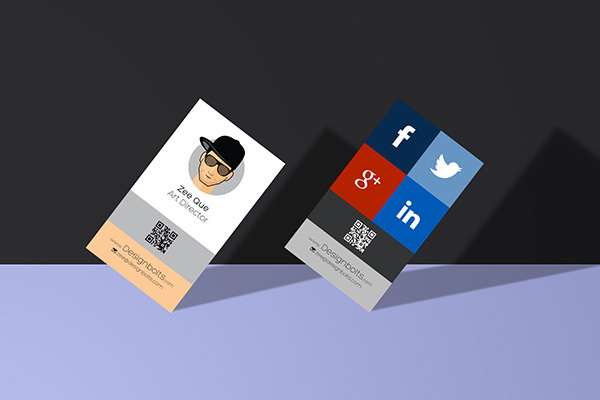 Now here I have free vertical business card design template & mock-up. You can simply insert in your own design element in order to show it off to your client as a presentation. It will be less time consuming and more impactful. Stay hooked to the blog because more is yet to come. Subscribe us for more posts and we won’t let you down.